Alam came to the United States from Bangladesh thinking she had escaped the cycle of alienation and abuse that made her life as a wife a waking nightmare. Without money, knowledge of English, or a network of friends, she soon found herself again powerless—this time as a domestic worker. 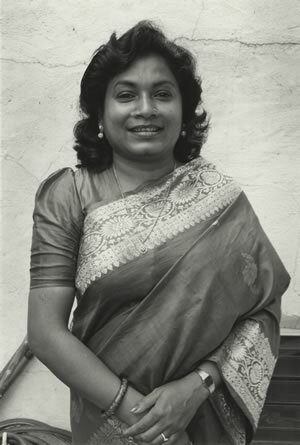 Now, only five years later, Nahar is not only self-employed and fluent in English, but a leader in the struggle against exploitation and mistreatment of South Asian domestic workers in the United States. At age thirteen, Nahar was forced into an arranged marriage with a police officer in Bangladesh. Upon entering his household, she learned, to her dismay, that he already had a wife and four children—including a son one year younger than herself. Nahar suffered terrible physical and emotional abuse from her husband and his family and attempted unsuccessfully to escape from him six times. Even within this context of hopelessness and despair, Nahar continued her education, which had been interrupted by her marriage, on her own. She also adopted her younger brother’s daughter and started a women’s organization—teaching writing, sewing, and poultry-raising as a way for women to earn independent incomes. Eventually, however, her husband’s unrelenting abuse forced Nahar to take more extreme measures to escape. In 1993, she was granted a visa to come to the United States. Because there is no legalized adoption in Bangladesh, Nahar was forced to leave her daughter behind. “When I arrived in the United States, there was no one to greet me at the airport. I spoke no English and had almost no money,” Nahar says of her arrival. She found lodging as the roommate of an entire family in Astoria, Queens, and began work as a garment worker, getting paid 35 cents per finished piece. In fifteen days she had made only $35 and realized she would have to find some other kind of work. Nahar embarked on a series of positions cooking, cleaning, and baby-sitting, often working twelve-hour days for as little as $50 a week. At one point, she was given only one day’s notice that she had been fired because the family for which she was working had found an Indian woman who would work for room and board. Fiercely determined to change her situation, Nahar spent long hours at the public library learning English. A sympathetic couple, who hired Nahar to tutor their daughter in Bengali on weekends, introduced Nahar to SAKHI, a non-profit organization for South Asian women. Soon she found full-time babysitting work at a decent wage for a family that respected her and allowed her time to volunteer at SAKHI and to take English classes at Hunter College. Unafraid of confrontation, Nahar organized protests and demonstrations outside homes of exploitative employers, implemented innovative outreach methods, and handed out flyers on legal minimum wage and unjust working conditions regulations. She conducted training workshops on workers’ and immigrants’ rights, on labor laws, and on negotiating with employers. In 1997, her group split from SAKHI and renamed itself Workers’ Awaaz, (“workers’ voice” in many South Asian languages). Nahar contacted Mike Wishnie, an ACLU attorney who specialized in labor rights, about bringing the case of an exploited member of Workers’ Awaaz’s case to court. He succeeded in getting a $20,000 settlement in back pay for the employee he represented. While fighting legal battles for workers’ compensation is not the primary goal of Workers’ Awaaz, Nahar wanted to set a precedent that would demonstrate to the women of Workers’ Awaaz that the rights they had learned they had on paper were very real, and that they should not be afraid to exercise them. Workers’ Awaaz now has a dozen volunteers and 30 domestic workers as well as funding from several foundations and public service organizations. Nahar would like Workers’ Awaaz to continue to reach out into other exploited, low-wage immigrant communities. She would also like to provide a safe space for domestic workers in need of a place to stay. Nahar Alam has made an enormous difference in the lives of many women who have come to the United States in search of freedom and independence, only to find themselves isolated from resources and community. She has triumphed over enormous odds and helped others find similar empowerment.